Jharsuguda : With not less than nine days to go for the second phase of election, the campaign of political parties have picked up in Brajrajnagar and Jharsuguda Constituency. The candidates and their supporters of all the parties are leaving no stone unturned and giving their best effort to reach out and woo each and every voters in their constituency. In Jharsuguda, Biju Janta Dal (BJD) has fielded Ex-Congress MLA Naba Kishore Das, who had left congress party and had joined BJD party. whereas Mahendra Kumar Naik, has been fielded by the Congress party and Dinesh Kumar Jain from the BJP Party for Jharsuguda Constituency. Jharsuguda assembly constituency consists of Jharsuguda Municipality along with Kirmira, Laikera, Kolabira and Jharsuguda Block. In last two Election, BJD party had lost the seat of Jharsuguda assembly constituency, fought by Kishore Kumar Mohanty against Naba Kishore Das, but this time, after induction of Ex-Congress MLA Naba Kishore Das from Congress to BJD party. It is eyeing a clean sweep in this assembly constituency. 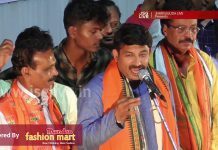 In 2014 election, Congress Candidate Naba Kishore Das had defeated BJD’s Kishore Kumar Mohanty by securing 74499 votes , where as BJP’s Anand Pradhan able to secure 21,047 votes and had remained in Third Position. On the other hand, Brajrajnagar assembly constituency, which consists of Brajrajnagar and Belpahar Municipality along with Lakhanpur Block and five Panchayats Rajpur, Chandnimal, Gourmal, Loisign, Kudopali of Jharsuguda Block, is set for witnessing a direct fight between BJD’s Kishore Kumar Mohanty and BJP’s Smt. Radha Rani Panda. Though Kishore Kumar Mohanty will contest for the first time from Brajrajnagar assembly segment, this assembly segment is not new, to the assembly segment as he is the District President of Biju Janta Dal. In this election, even Congress has decided to backed CPI’s Ramesh Tripathy for the coming election from Brajrajnagar Constituency. In 2014 Election, BJP’s Smt. 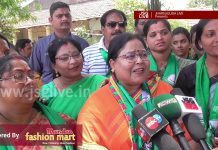 Radha Rani Panda had defeated her rival BJD’s Anup Kumar Sai by a securing 50736 votes. Where as Congress Candidate Kishore Chandra Patel secured 38,175 and remained in the third place.